Trips may start from one of eleven access points located throughout the area. Some of the routes are loops. The area is ideal for novice canoeists, families and groups. If you have any questions about routes or are looking to get recommendations for your ideal trip, call the knowledgeable staff at the Algonquin Highlands Trails Office at 705-766-9033. The following routes are available depending on the desired experience, trip duration, equipment and level of experience. Campsites and portages are marked. Much of the area is public lands and water, however private cottages, docks and roads should be respected at all times. These descriptions are suggestions only. It is possible to put together a route completely of your choosing, these are just guidelines to give you an idea of the possibilities. To view an online interactive map of the area visit the Fees, Reservations and Online Maps page. With the number of recreational users accessing the area increasing, we must all develop a style of camping that has the least possible impact on the environment. The ideal of the modern voyageur is look back and see no evidence of his or her passing. If you achieve this ideal, you will be able to remember your trip with that extra satisfaction. Please practice leave no trace camping. There are no garbage facilities at campsites or access points, please plan to pack out all garbage and bring it home with you. Do not leave any garbage on campsites, in the fire pit, or in the campsite toilet box. This route is favored by a number of youth camps as it allows group camping on Kabakwa, Sherborne and St. Nora Lakes – it is also close to amenities which can be good for safety reasons when tripping with groups of inexperienced youth. – There is one portage which crosses Hwy 35, extreme caution must be taken. 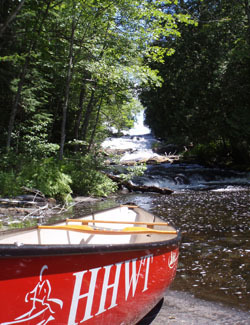 Popular route – easy weekend getaway, 1 easy portage. Facilities: Parking, toilets. Trails store/office and boat ramp at Frost Centre Access. Points of Interest: Very scenic High bluffs in South East Bay of Sherborne Lake. Sherborne Lake has numerous secluded bays and islands to explore. Excellent camping and swimming. There is a natural sandy beach at the Sherborne Lake access point which is excellent for day trips. Loop trip – this is the best loop trip in the Frost area and is perfect for a long weekend getaway. Points of Interest: Clear Lake is noted for its incredibly clear waters where one can view depths of more than 30ft on a calm day. Old growth Hemlock and Pine trees can be found throughout the Clear Lake Conservation Reserve. The river between Nunikani and Big Hawk Lake is very scenic. Blackcat Lake is ‘Meromictic’ and provincially rare (see write up on conservation reserve). There is also a one of a kind, full size log chute at the dam from Big Hawk Lake with picnic area, walking path and interpretive pavilion. Short route, very scenic, secluded small lakes with calm waters and marshy bays surrounded by mature Hemlock/Pine forest, and high hills. Points of Interest: Black River – portages go around scenic waterfalls on the Black River and are worth the effort. Small islands, great for exploring are found on McEwen, Three Island and Horse Lakes, extensive wetlands along the Black River afford excellent opportunities for viewing wildlife. Points of Interest: Scenic Brandy falls - located on the black river between Ernest and Gun Lakes, towering high rock bluffs on south east arm of Raven Lake. In spring, when water levels are high, access to Sherborne Lake from Big Hawk Lake can be paddled without portaging through the narrows. Points of Interest: Crab rapids – located on the river just east of the portage from No Name Pond to Big Hawk Lake. Hawk Lake Log Chute is a full size, one of a kind log chute located at the Big Hawk Lake Dam with a picnic area, walking path, and interpretive pavilion. Little Hawk Lake is a relatively large lake and winds can get strong. Points of Interest: There is a Totem Pole at the narrows at the south side of the island between Little Hawk and Big Hawk Lakes. Blackcat Lake is a Meromictic Lake (see write up), Clear Lake and Blackcat Lakes are known for extremely clear waters, depths of 30+ft can be seen on calm days. There are Old Growth Hemlock and Pine trees throughout the Clear Lake Conservation Reserve. Remote backcountry, low use on portage from Little Margaret to Browns Lake and Browns Lake to South Jean Lake, these portages can be very overgrown and difficult to follow – put in on Browns Lake is in a Cattail Marsh – mud wading or bushwhacking is required. Points of Interest: Marsh/river area at south arm of South Jean Lake, excellent area to view wildlife including beavers and turtles. Very remote backcountry, water levels may be low and impassable at times, portages and campsites get seldom used and seldom maintained. Portages can be overgrown and difficult to follow between Knife and Mooney Lakes. Points of Interest: This area is the head waters for the Black River watershed which flows all the way to Lake Simcoe and then to Georgian Bay. The marshy areas in between Mooney and Hosiery Lake are excellent wildlife viewing areas. There are 11 road access campsites along the Sherborne Lake access road off of Hwy 35. This road is use at your own risk and is not regularly maintained. It can be rough in places, especially east of Little Avery Lake. Washouts are possible. Cars are not recommended. Call the Algonquin Highlands Trails Office for current conditions, information and recommendations. This is a base camp style trip with numerous excellent campsites to choose from. Beginning with a short portage to access the lake from the Big East Lake access parking area at #5128 Hwy 118, half-way between Carnarvon and Bracebridge. Big East Lake is a large lake with many arms, bays and islands to explore and fish. This lake is home to several remote hunt camps. This backcountry loop is perfect for a long weekend and starts at #5128 Hwy 118 (Big East Access Point parking lot). Once you unload your gear at the parking area, cross the highway to Bentshoe Lake. From here follow a series of short portages northeast into the Crane Lakes, Poker Lake, Muck Lake and then Cinder Lake at the north end of the loop. The most popular weekend outing is to get to Cinder Lake on the first day, set up camp and explore. To return, continue south through Quirt and Ooze Lakes returning to Poker and Bentshoe Lakes. The loop is best done in this direction as it puts the hills in your favor when crossing several of the portages. This an excellent trip on smaller lakes and ponds with opportunities to view wildlife, flora and fauna. Bentshoe Lake has the highest traffic in the summer months with traffic decreasing with the more portages you put behind you. If you are lucky enough to reserve the only campsite that is located on Poker Lake you will have the entire lake to yourself.